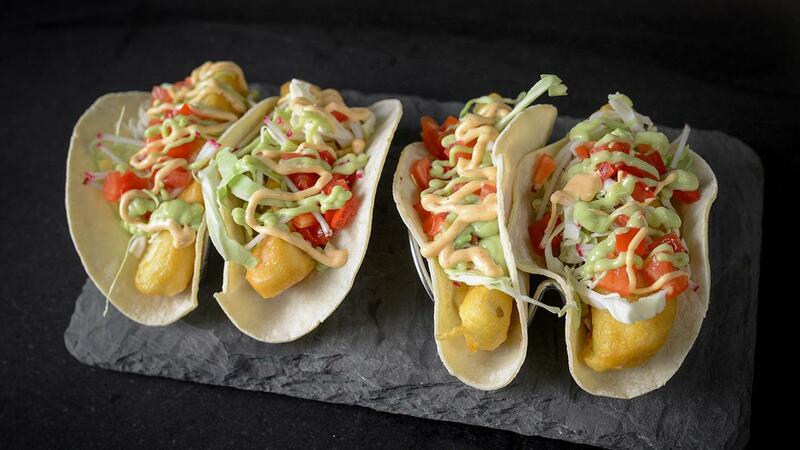 Crispy coated fish in fresh tortilla and variety of toppings, a classic street food. Heat canola oil to 190°C. Mix together all dry ingredients for the batter, and in a separate bowl, blend together the mustard and water. Mix the dry and wet ingredients and blend until smooth. Mix together the Hellmann's® Real Mayonnaise and Hellmann's® Ancho Chipotle Dipping Sauce. Put into a squeeze bottle and set aside. Blend the avocado, lime juice and the remaining water using an immersion blender. Put into a squeeze bottle for serving. Heat the tortillas to soften. Place a fish slice on the tortilla. Top with cabbage, tomatoes, Chipotle Mayonnaise, Avocado sauce and radishes to liking. Serve.